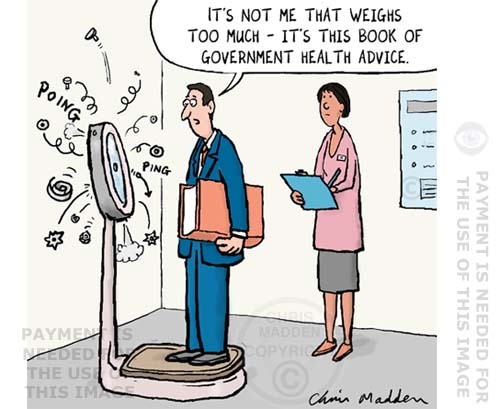 A cartoon showing a man standing on weighing scales, with the scales breaking due to the great weight of the book of health guidelines that the man is holding. 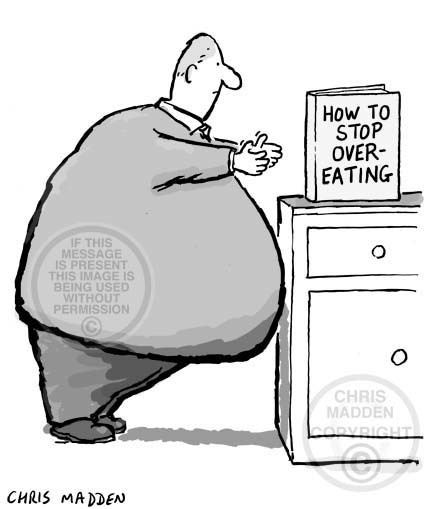 A cartoon of an overweight person trying to reach a self help manual about how to stop over consuming. This cartoon is about excessive consumption of all types – it depicts an obese person (an over consumer of food) to represent all types of over consumption. The point is that the obese person can’t reach the book because of his obesity. A cartoon showing a dieter stamping on a diet book. 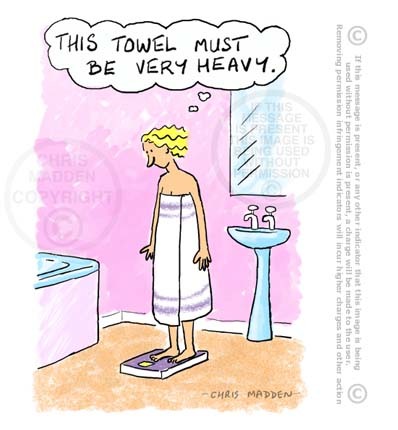 Dieting cartoon – a weight-conscious woman weighing herself and thinking that the towel she’s wearing must be very heavy. Diet cartoon. A dieting person weighing herself on bathroom scales and being unhappy about her weight – and thinking that her weight on the scales must be higher than it really is because of the weight of a towel that she’s wearing. A cartoon about obsession with weight, self-deception, obesity, anorexia, nutrition. 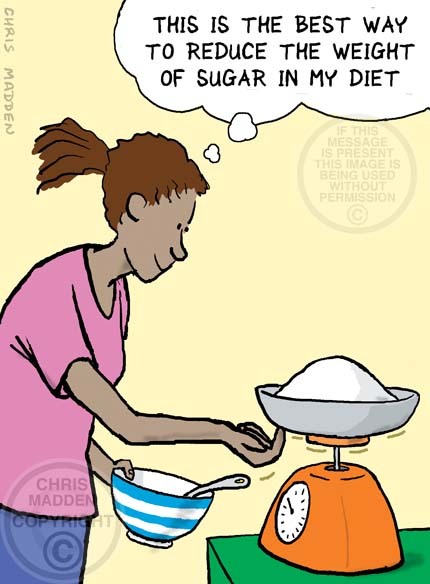 Diet cartoon. 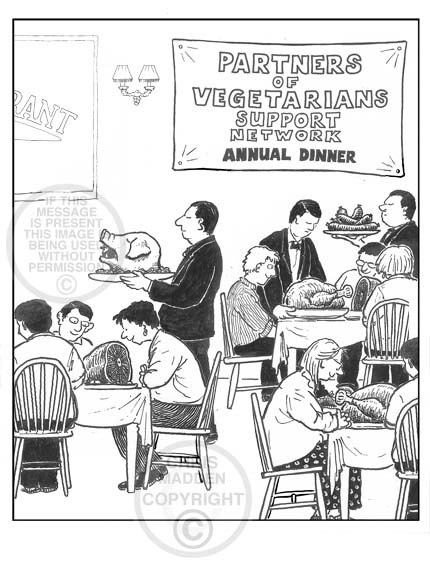 A cartoon about gluten intolerance, lactose intolerance, dietary fashions and food fad intolerance. A cartoon about food intolerance, showing a person who is gluten intolerant (and who is rejecting some bread), a person who is lactose intolerant (and who is rejecting some milk) and a person who is food fad intolerant (and who eating a plate full of food that is normally labelled as unhealthy). A cartoon about food fads, health, dietary fads, ibs, irritable bowel syndrome, nutrition, allergies, allergy, allergic reactions, food scares. A cartoon about the way that people modify their behaviour in the presence of other people, especially to accommodate the other people’s social, ethical and cultural principles or mores. Cartoon showing the Pied Piper leading children to a cave. 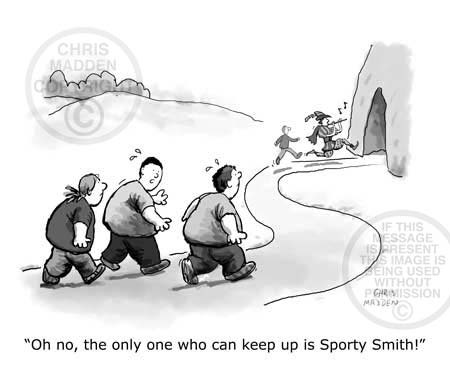 However, the children are all too obese to keep up with him, except for one fit child. 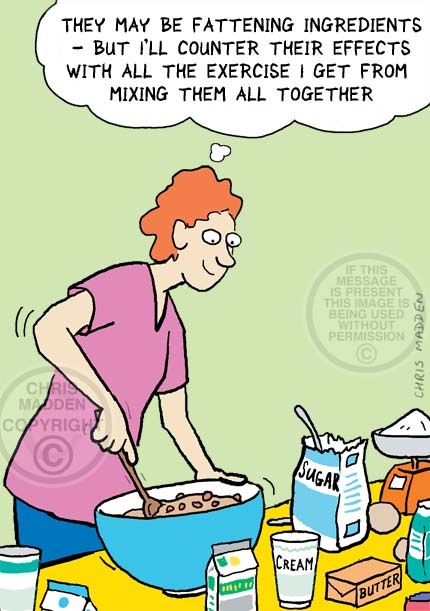 Does mixing ingredients count as ‘exercise’? Obesity cartoon: an obese or overweight person compulsively trying to eat more food. Possible cartoon title: Reach for the pie. Food cartoon: achieving a balanced diet.